is best known as the drummer in the original Pat Metheny Group, but has also performed and recorded with Sting, Chick Corea, Herbie Hancock, Gil Evans, John McLaughlin, Manhattan Transfer, Stan Getz, Randy Brecker, and many others. 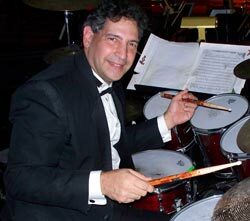 He currently performs with Gary Sinise's Lt. Dan Band, and is a tenured Associate Professor of Jazz Studies at the University of North Florida in Jacksonville. Click here to visit Danny Gottlieb's website.